Your eyeballs aren’t just holes in your head that light goes through. Let’s look at a quick comparison between how Light is broadcast to your brain so you can “see and be informed” about your surroundings and how the “News“ is broadcast so you can “see, and be informed”. Both turn out to require intricate manipulation. 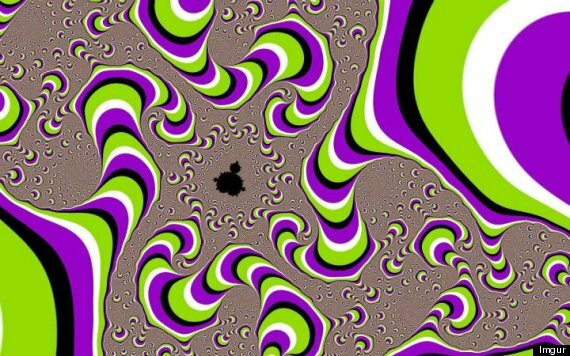 NOTHING in this is moving- it just APPEARS so. The Cornea bends light frequencies as they go through your pupil. — The News reporter twists all events to find the most captivating -scariest- most reactive story to send in. “If it bleeds it leads”, right? The Iris (colored part) that surrounds your pupil makes the hole bigger or smaller to regulate the amount of light allowed in. — The TV scheduling regulates a timed performance, a 1/2 hour or an hour, according to what ratings need. Light then passes through the Lens which changes shape so it can further bend the rays. — The on set reporter adds more Voice Inflection, Music, Drama, Graphs and Statistics and more extreme information to support their particular tone or frequency pitch they slant towards. Cells in the Retina then convert the light to electrical impulses. — You choose to watch someone else’s drama, violence, injustice, etc… that changes your positive charge to a negative charge. OK, end with a 20 second story about a sweet little puppy that found its way home, so the news team doesn’t feel like all they did was just scare you needlessly. — You end up eating another snack or something sweet to take your mind off the horrible things they just showed you. Seeing does not equate “reality”. We would do well to remember that Colors, Shapes, Size and NEWS all depend upon how those factors are manipulated through a View Finder. This entry was posted in Daily Blogs and tagged Life, news, Power of positive thinking by MomentumMikey. Bookmark the permalink. ALWAYS thinking and feeling, just kinda’ decided that most of what I learn means only something to me. So, I may write, may not, but ALWAYS unfolding my life. Like you. take it easy and enjoy all that you are learning!